ca. 1800, originally from the private collection of James Harvey Young. 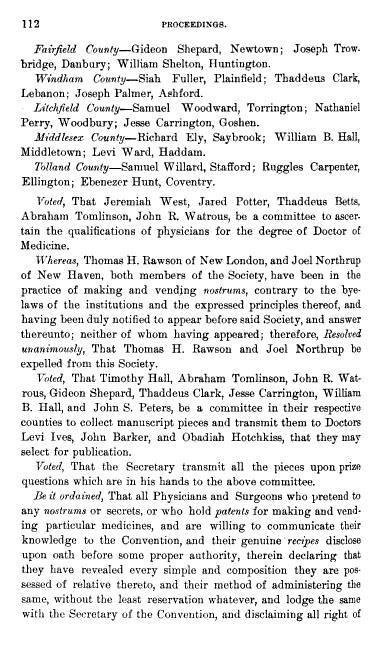 Doctors Samuel H.P. 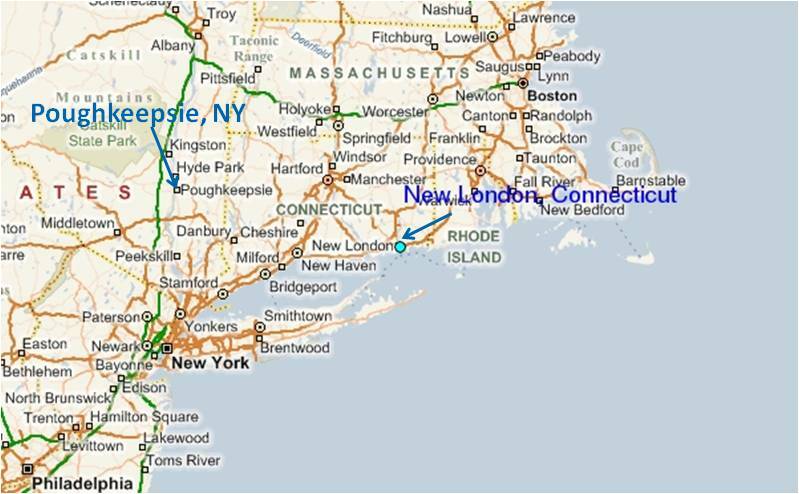 Lee of New London, Connecticut, and James Livingston Van Kleeck of Poughkeepsie, New York have several life experiences that are very much related. Both were considered leaders in their profession and politically active in their local communities. Both were also heavily into marketing what contemporary medical historians refer to as “Quackery.” Doctor Samuel H. P. Lee invented and marketed a miracle cure for yellow fever, one of the major epidemics for this period in American medical history. 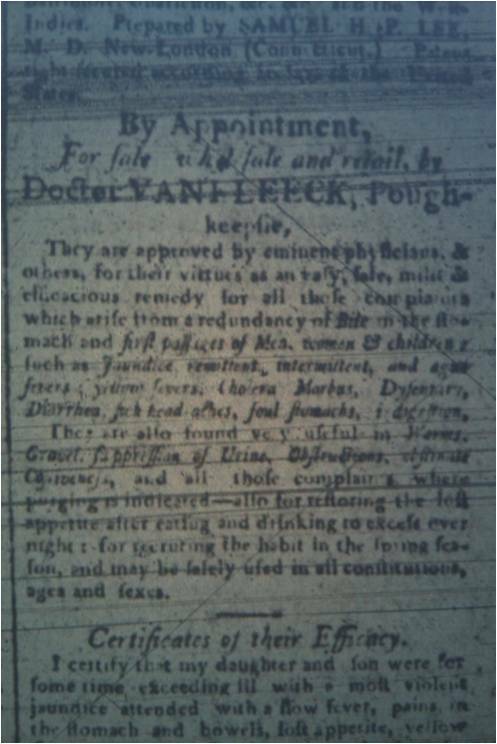 Doctor Van Kleeck was the primary promoter of Lee’s remedy along with many more, selling these at his stores in the village of Poughkeepsie and Red Hook. Doctor Lee founded his philosophy or belief and invented his cure about the same time Dr. Perkins from Connecticut discovered his own magical cure–metallic tractors or pointers. Unlike Perkin’s cure, which cost anywhere from 5 to 25 dollars to own, Dr. Lee’s cure was in simple bottle form and fairly inexpensive. Each of these methods of healing had very different philosophies regarding their use. 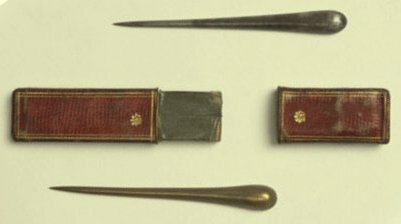 Dr. Perkins’ cure consisted of a pair of metal pointers about two inches in length. These pointers had slightly blunt tips, and were designed to be passed over the body by hand, lightly touching the skin as one rejuvenated, reduced and/or moved “the vital force” about the disease organs, thereby effecting a cure. This philosophy was based upon the galvanic or “nervous force” theory promoted in the early post-Revolutionary War years, a theory colloquially termed brunonianism by later members of this profession. This new theory was proposed in the 1770s but didn’t reach popularity until about 10 or 15 years later, at which time it was in competition with the other belief for the time known as the solidist theory of disease. Solidism was a concept popularized by William Thacher, and at first was meant to be in opposition to the “humours” or fluid theory of disease and the different renderings of this belief system that had been around for quite some time. The solidist theory stated that the various organs of the body were most important to defining the health of the individual. 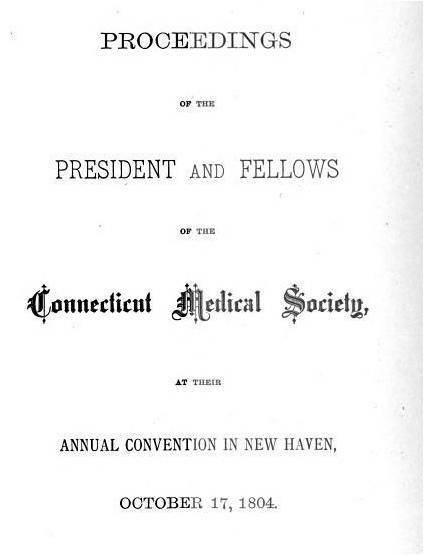 During the late colonial years of New York and Hudson Valley history, this seemed to be a natural successor to a related philosophy then popular in the region, Theophilus Borden’s theory of disease and human physiology which stated that the organs (brain, heart, liver and lungs) were most important to life and that the brain in particular harnessed and used the energy of the body needed for vitalism or life. This use of vital energy (not his term for this) occurred in specific ways when it came to the maintenance of the body’s physical and mechanical state of being. The primary mechanism by which the brain accomplished this was secretory in nature–a predecessor in some ways to the hormonal theory that later developed during the mid-19th century due to scientific progress. Somewhere between Perkin’s theory, Thacher’s theory and Borden’s theory resided the truth about health and disease. These theories were brought together for a while during the late 1700s and early 1800s. By the 1790s, the solidists (the notion of physical tissue/organs and disease, versus energy and disease) and the related Bordenian approaches (three organs are most important to the body and health) resulted in the common belief that the liver was most important to overall body health. This belief led many to adhere to the oldest claim for the time–black and yellow biles were related to one of the most common local diseases for the time–yellow fever. 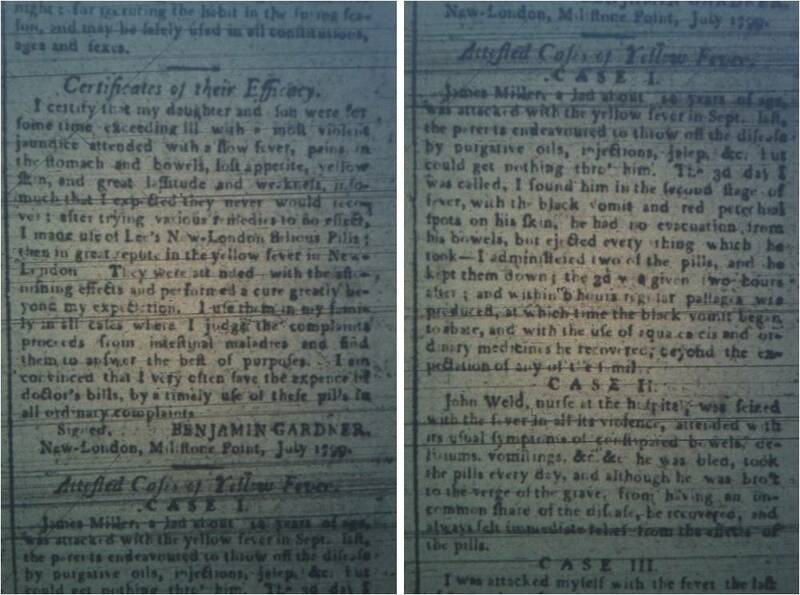 Yellow fever was so named due to the changes in skin color it produced, with the yellow bilious representing soon after the disease commenced, followed by a transition into a dark greenish, blackish bile state, indicated by a green-blackening of some individual due to prolonged illness and finally a blackening of the face and eyes during the hours before death. 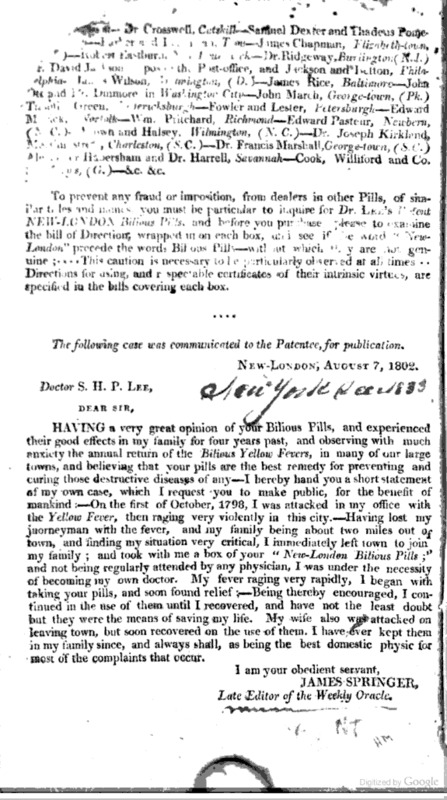 Due to these observations, Dr. Lee’s philosophy about the bilious fever and his method of curing it became a highly marketable claim, and like Perkins and others trying to bolster up local support for their new discovery of a cure, his sales depended upon claims made by local citizens who experienced these effects from his product. Whatever a new “cure” was discovered, it was subsequently patented, and made sellable to the common household. These products were then sold by the local newspaper advertisements and/or by way of local travelling salesmen. 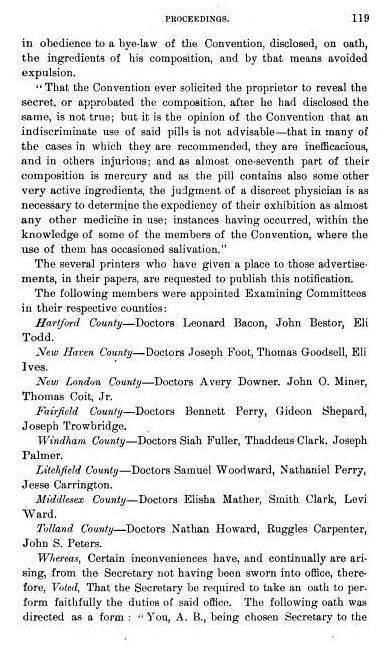 Lee’s remedy was the first American patent medicine to be patented and sold in this manner. It history became the first of a series of tales about how and why the patent medicine industry was born in the United States. the Poughkeepsie doctor James Livingston Van Kleeck was one of the major contributors to the success of Lee’s cure, as well as the cure of several other patent medicine inventors and producers. It was during this same meeting that Dr. Lee’s remedy would also be contested, and that Dr. Lee would take advantage of this session to share his recipe with both the patients and his colleagues should any of them choose to test this remedy again the yellow fever. This saved Lee and his remedy from receiving the full criticism of his society, and gave him a short reprieve from any possibility of professional denouncement and expulsion, enough for his product to take off in different cities of the United States. One decade earlier, the use of human bodies to make such a claim was taboo, across all parts of this country. 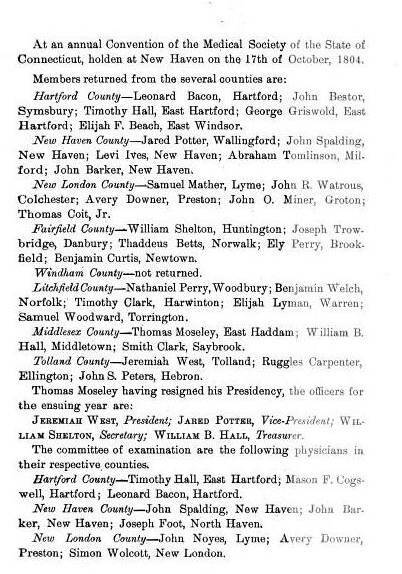 The bodies of prisoners and deceased grandparents were on occasion used to teach medicine within medical school settings in Philadelphia and new York City, but their use in a similar fashion on a regular basis within a local community setting was non-existent. In the local Hudson valley region, local physician Shadrach Ricketson tried to change this habit by presenting to the general public his argument for the death of his colleague, a Quaker elder. This practice of publicly practicing an autopsy procedure was perhaps short-lived, and in comparison with the public hangings, duels by sword or pistols common to the time, may not have seen as offensive to the public during the time as it might have been interpreted just a decade or two later. 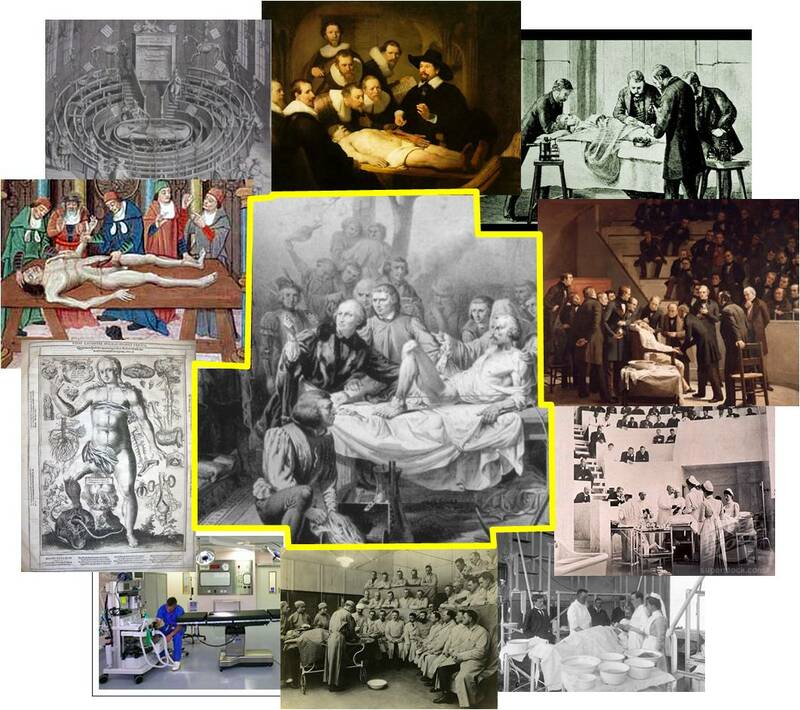 In upcoming years, this and other practices engaged in by coroners studying the deceased through autopsy became very important to public health and the medical profession. For this reason, in 1802, when Dr. Lee reported his findings of some recent yellow fever patients, his description and discoveries barely raised any concern by the public. Dr. Lee proved that he had a very good reason for why he made the claims he did about regular medicine and how it was treating yellow fever victims before their demise. These claims would ultimately benefit the marketing of a remedy he was about to release to the public, but no one knew this at the time when they read his letter published in the local newspaper. Dr. James L. Van Kleeck was just an observer for both of these events in medical history. He resided just a few dozen miles west of the country where this medicine was faithfully being practiced by individuals who either believed in the metaphysical philosophy of the vital force proposed by Perkins, and/or wished to follow the preachings of the highly respected Dr. Lee. Both Lee and Perkins came from a family of high respect to the American military leaders and the their state medical profession. Both were descendants of Revolutionary War surgeons. Elijah Perkins’ father was the founder of the state medical society. Dr. Lee’s father was a promoter of this philosophy of treating the liver to perfect the cure for a new fever erupting locally just before the Revolutionary War took hold. Most important to the region was the social perspective that developed for Dr. Samuel Lee once yellow fever struck the region. This disease that would ultimately kill Dr. Elijah Perkins, and his nephew Benjamin who tried to promoting the same belief system about 10 years later. This effect of nature, or God, upon man was more lenient for Dr. Lee. Dr. Lee claimed that this remedy his family invented worked by controlling or taming the liver and teaching it to eliminate the excess amounts of bile from the blood that were building up under certain environmental conditions, allowing the body to purge itself of this excessive material and hopefully preventing, or eliminating, the yellowishness that could ensue along with the new epidemic for the time–yellow fever. When the yellow fever came ashore in 1794 it turned Dr. Lee into a hero in the public eye. He remained in New London as it made its way further inland in the state and struck New London for the first time. 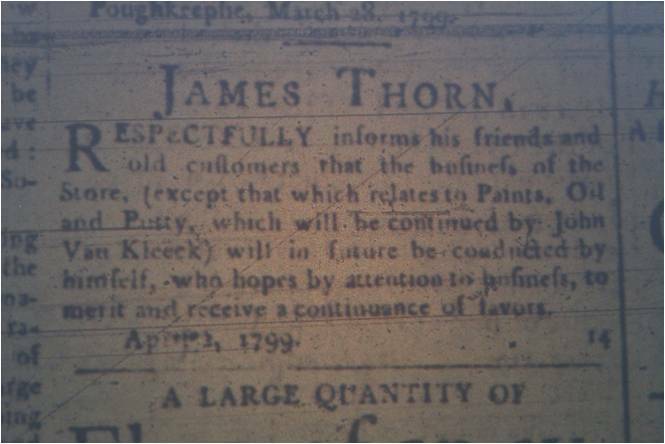 In one of the first articles published in the Connecticut newspaper, written by Dr. Lee, his success in treating this epidemic is described, which was subsequently reprinted in the Poughkeepsie Journal. From this article we learn about an important discovery he made for treating yellow fever victims–avoid the practice of bleeding. This discovery was ignored for generations following its publication. In the months and years to come, bloodletting was also recommended by Benjamin Rush and other military officers and physicians. I think it my duty to communicate thru the channel of your paper, the appearance [of] dissecting a person who died … [ from yellow fever? ] … hoping it may throw some farther light on the nature and progress of this disease. The person was a man of [spare] habit, temperate, and industrious in [course] , between 30 and 40 years of age—was attacked with the fever on the 12th inst. and died on the 17th after the full endurance of the disease, [not] having been bled, nor the violence of reactions moderated, but by mild cathartics [received/once or] twice repeated, on opening the two cavities of the trunk, there was an universal appearance of [high inflammation], without any mortification, neither was there any smell in the least disagreeable; the surface of the lungs was covered every where with congested blood vessels of a dark and bluish color, and in every respect marked their distribution as minutely as the best of plates; their buff [?] was not contracted, and appeared in some spots as if bruised; there was a little extravated blood in the cavity; the heart natural, tho’ remarklably white, as if it had been boiled; in the pericardium little or no moisture appeared; the stomach, more particularly the lower orifice, had been much inflamed, and was somewhat [inundated]; the aorta and large blood vessels were surprisingly distended with black blood, the liver natural, except having been highly inflamed—of a pale color, and quite empty of blood—without any appearance of sphacelation [def: gangrene]; –the gall bladder was almost obliterated, and containing nothing but a little slimy black matter, adhering to its coast, resembling what is vulgraly called Frogs-spawn; there was every where a diffusion of yellow bile; the spleen had the appearance of a rotten liver, and was full of black clotted blood; the other viscereia a natural state, except generally covered with congested blood vessels; the urinary bladder contained near a pint of yellow slimy liquor. The subject sat 16 hours previous to his death, had a total suppression of urine, and ,it evidently appeared to arise from a local inflammation of of the bladder, which resembled bruised meat, being of a livid color, and in some spots its texture entirely destroyed. From the above appearances there is the strongest evidence of a high-degree of inflamation, producing an increased impetus of the blood; and strongly debates the necessity of judicious blood-letting in the very commencement of the disease: Too many have taken a sacrifice by a neglect of this timely remedy.—I think it my duty to mention that there are now upwards of twenty persons in this city, recovering, after the use of the lancet, purging, a mercurial [routine]: And I have had the pleasure of seeing members of my fellow citizens, who, instead of endavouring to brave out their first complaints, have called at my shop, and lost blood the next day nearly rid of every symptom. I feel myself warranted at this time to attribute the recovery of numbers who were taken sick in solitary houses, to the vigilence of our Health Committee in discovering their situation, and have them immediately bled. In great haste, I subscribe-myself the public’s humble ser’vt. As was the case for inoculation, the controversy and disputes about how to best treat patients with yellow fever remained unresolved. For this reason we find various opposing opinions at times published about this in the Poughkeepsie Journal articles. 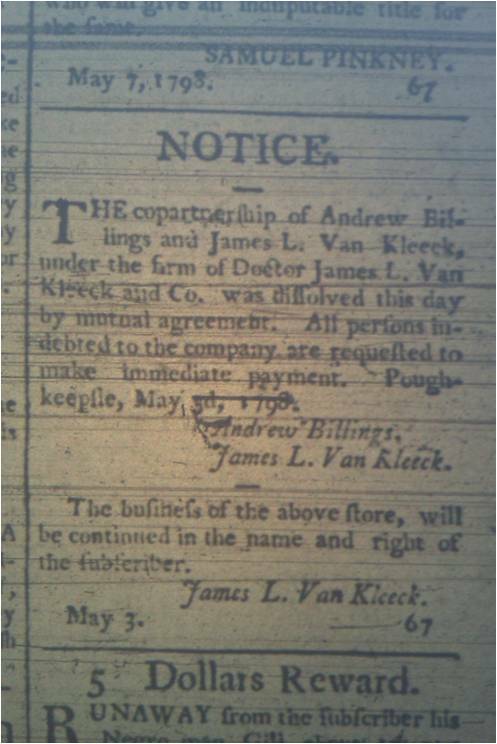 Important local physicians like Dr. Van Kleeck also appeared to be somewhat undecided, although Van Kleeck’s advertisements in the long run seemed to be more supporting of remedies for yellow fever that avoided the use of the lancet followed by an administration of mercurials, in exchange for using Dr. Lee’s Bilious Fever recipe or its main competitor Dr. Church’s Jaundice Bitters. Dr. Lee recommended that physicians not perform blood-letting on any of the patients with yellow fever. He based this on his own evaluation of the corpses of those left behind when this disease prevailed in New London in 1796. In a recent review of the internet notes on Lee’s bilious pills, mention of it is made briefly in a book on the history of medical fraud. However, this writing failed to provide a correct version of this story and mistakenly claimed Lee’s original recipe for this remedy for being significantly problematic, making no mention of its more popular rendering by Benjamin Rush (a more modern rendering of which follows). Comparing the two recipes, Rush’s version contains colocynth, aloes and gamboge, three very traditional laxatives, whereas Lee’s recipe excluded colocynth, substituting it with scammony (very much akin to Jalap) and Buckthorn (aka Cascara sagrada). The differences between these two recipes were minimal, but had different histories due to their different political and medical paths. Many of the other physicians may have heeded Dr. Lee’s warnings and followed his suggestions, were it not for the substitute form of therapy Dr. Lee recommended–the administration of some Bilious pills that he had perfected. Dr. Lee’s liver remedy was much like that of Dr. Benjamin Rush residing just two states down in Philadelphia. For some reason, Dr. Benjamin Rush’s cure for bilious fever received the respect of President Thomas Jefferson and became the primary commodity for treatment carried by Lewis and Clark during their excursion westward in 1802. Meanwhile, in New London, Connecticut, Dr. Lee’s recipes for bilious fever did not fare so well with the medical profession. He was able to convince others of his profession and their professional committee to accept his recipe, asking that they at least give it a try. In the end, Lee suffered greatly from the profession branding him as someone close to the many other “quacks” they were then dealing with who made ample use of such self-created miracle cures. 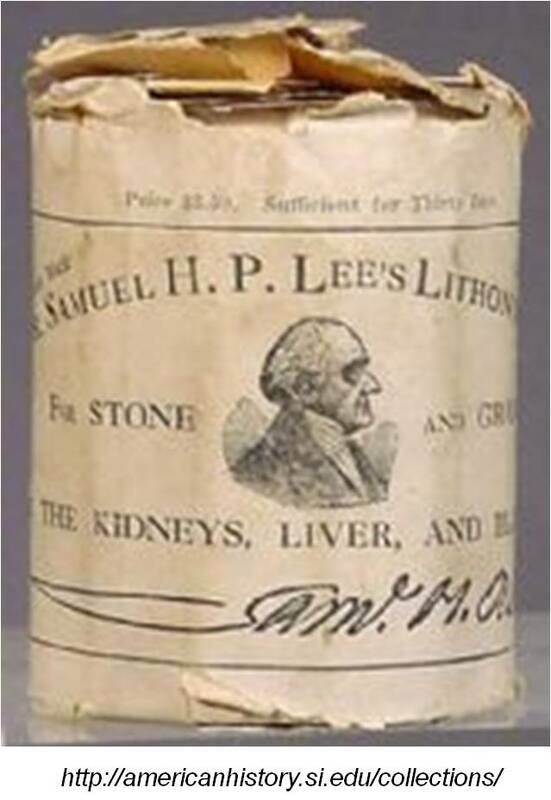 Over the next two decades, as Lee’s Bilious Pills made their way throughout much of the American culture, Dr. Lee also made history by becoming the first physician in the United States to patent his recipe, there providing it with nearly 30 years of financial success. Only in this way was he different from Benjamin Rush. 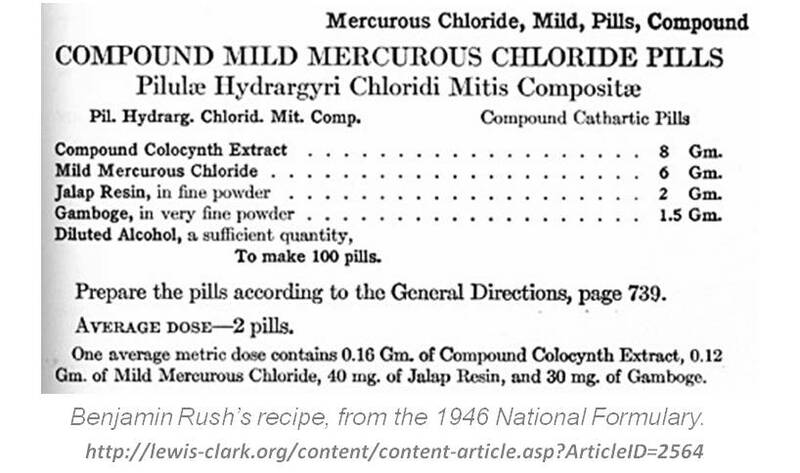 Rush did not patent the remedy that he invented–attaching his name to the recipe and its infamous use by Lewis and Clark were the reasons this remedy lives on in American history. In Poughkeepsie, at the time Lee’s pills were becoming famous, a local Poughkeepsie doctor who at times was more a drug store salesman and mountebank than a physician, became the chief distributor of Lee’s remedy for the region. Some circumstantial evidence for the time, also noted in the Poughkeepsie Journal, suggests that medicine in the Poughkeepsie village setting had yet to define its most loyal followers of the profession in general, and its most logical route to follow in terms of defining whatever healing faith and philosophy was to be followed the most by the people in this region. As a Secretary of the Dutchess County Medical Society, Dr. Van Kleeck seemed minimally involved with medicine as a physician or a surgeon, other than to be the go-between for you, your true doctor, and the type of illness you needed to treat. Dr. Van Kleeck offered the various types of physical remedies that would be recommended to you by your physician. But if you did not have a physician you could see for your problems, Dr. Van Kleeck was ready and willing to provide such services. 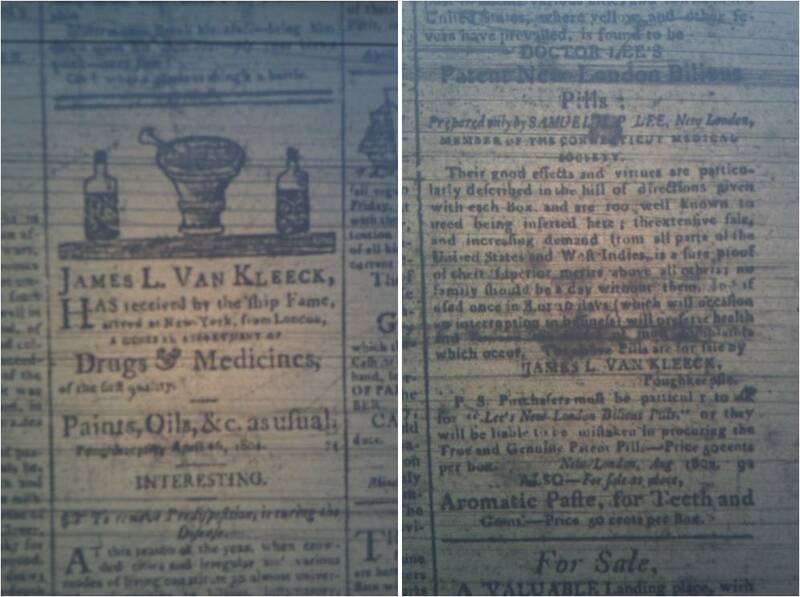 When you went into Van Kleeck’s store for your cure, you were most likely to be approached as a know-nothing in dire medical straits, with need for advice but not much more clinically. Following a brief visit, and consultation by Dr. Van Kleeck, you would then walk out with the miracle drug in your hands. So what was the difference between Dr. Van Kleeck’s way of treating and the numerous others who passed through this part of the Hudson Valley with their own “snake oil cures”? Little to nothing, except that Dr. Van Kleeck was an established part of the local profession, and the others were not. The others could have been German physicians passing through, hoping for a small local following in the village setting, but expecting a warmer welcome from the German speaking communities located further north [Rhinebeck, just south of Red Hook, heading north into Columbia County]. Still others we have already seen evidence for–such as the Puritan physician Dr. Arkalus Hooper, who bears the same name as the famous Hooper’s pills meant to treat “feminine problems,” or Quaker physician Shadrach Ricketson, who was regularly published in the Poughkeepsie Journal as a medical climatologist (his weather reports), and who was just about to publish his book on domestic medicine. There was certainly a lot of cultural and philosophical diversity in Poughkeepsie at the time it became incorporated and its chief “doctor” Van Kleeck opened his stores, a drug store and an independently run mercantile business with Robert Thorn and Andrew Billings. 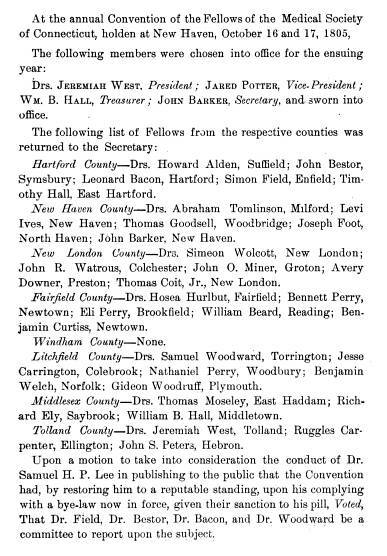 Dr. Van Kleeck and Dr. Thorn dissolved their partnership in 1797/8, about the time the philosophies of Dr. Lee, Dr. Perkins, and another unique character, Episcopalian Teacher, Deacon and Doctor Caleb Child. Dr. Child, and members of several other Dutchess County families, promoted yet another version of the energy or vital force philosophy of healing being promoted in Poughkeepsie. 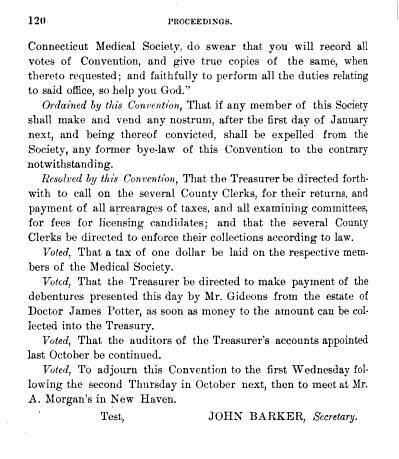 As soon as the medical society was formed and met, in response to Governor Clinton’s request that physicians be certified by a state committee of physicians and justices before being allowed to practice, Dr. Child was granted a license to practice by local Chamberman and future Justice Henry Livingson. Caleb Child strongly promoted the vital force concepts of medicine, practicing various versions of static electric and galvanic cure. The simple physical workings of Dr. Van Kleeck’s remedies could not compare with Dr. Child’s beliefs. A simple view of Dr. Thorn’s philosophy based on his work suggests that he was more in tune with Dr. Van Kleeck’s ideology. Dr. Thorn was not that much into vital force concepts and the metaphysics behind a cure. Dr. Thorn was very much into a much simpler protocol for treatments–puke, purge and bleed. His practice was approaching the basic format of the simplistic method of treatment promoted by Samuel Thomson just 7 to 10 years later, a method of treatment and cure that also worked in threes. Dr. Van Kleeck’s competitors were certainly more metaphysical than him, and more culturally-bound, personal, and metaphysically, philosophically, and religiously oriented. There was very little Van Kleeck could do to win out over his competitors with this much philosophical unrest in a profession that he was a leader of, but otherwise not much in charge of. Domestic recipe from The family physician, or every man his own doctor: in three parts … (1833) by Daniel H. Whitney, Frank Branson Petrie. Notes: Ingredients for the following are Gamboge, Aloes, Cow Parsnip, Castile Soap, Sal Nitre, and Molasses. Garcinia Gamboge oil-gum-resin and Aloe Gum are provided as purified apothecarian materials. Cow Parsnip is a local plant from which an extract is made. This recipe is far from the original recipe, and is probably a substitute or “poor man’s” version. GENEALOGICAL TABLE OF THE LEE FAMILY, FROM THE FIRST EMIGRATION TO AMERICA In 1641. BROUGHT DOWN TO THE YEAR 1851. COMPILED FROM INFORMATION FURNISHED BY HON. MARTIN LEE, OF GRANVILLE, WASHINGTON COUNTY, N. Y., AND FROM OTHER SOURCES, BY THE REV, WILLIAM H, HILL, Of Morris, Otsego County, N. Y.
ALBANY : WEED, PARSONS & CO. 1851. EZRA LEI (my Grandfather,) was an officer in the Revolutionary War. 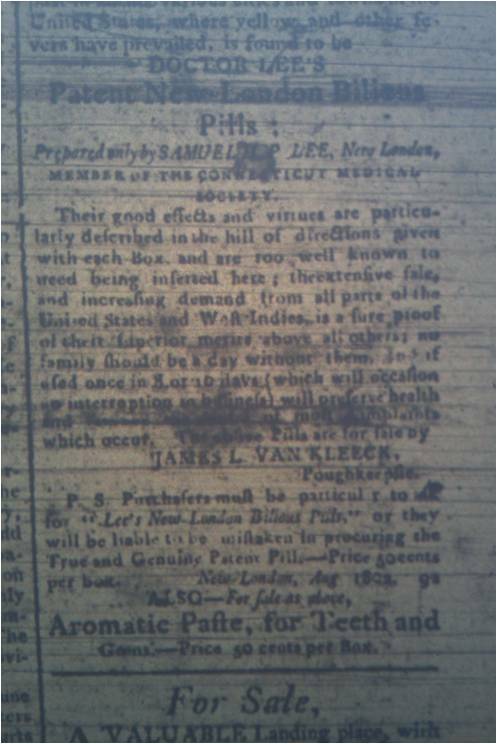 Advertiser of November 15, 1821, where it appeared as a communication. time he declined the service. tions upon the roof of a house in Broadway, anxiously waiting the result. prevented their affrighted crews from leaping overboard. speculate upon him, but concluded a drifted log had paid them a visit. 4th, SARAH TABER, who died unmarried. Medical advice to seamen; with directions for a medicine chest by Samuel H. P Lee. 1795 (English) 7 versions. 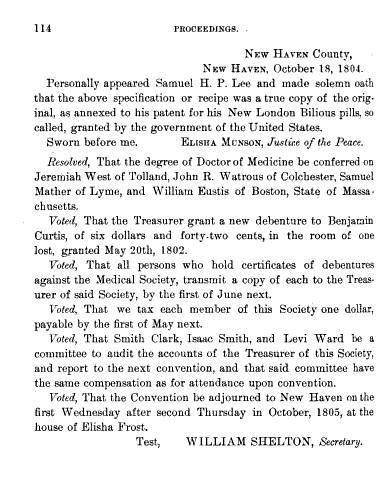 Lee’s genuine (Windham) bilious pills, or family physic Prepared by Samuel Lee, of Windham, in the state of Connecticut by Samuel H. P Lee. 1 edition published in 1791 in English. 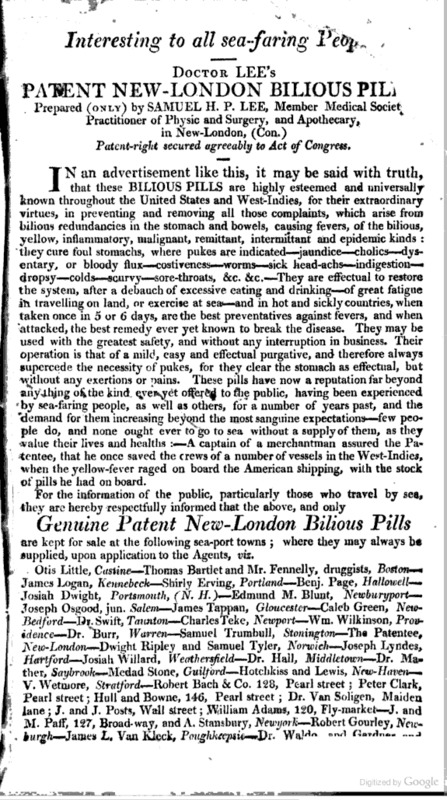 Doctor Lee’s patent New-London, bilious pills only prepared by Samuel H.P. 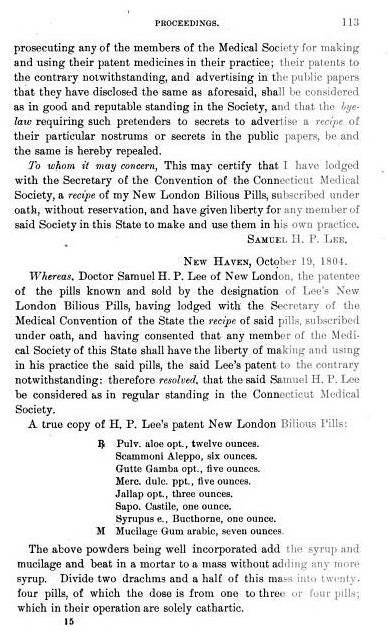 Lee, physician, New-London, … (Patent right secured according to law.) by Samuel H. P Lee. 1 edition published in 1820 in English. Remarks on the stone and gravel in the kidneys, liver and bladder, with an account of the discovery of a solvent remedy, now used with universal success, and commonly known as Dr. Lee’s gravel specific by Samuel H. P Lee. 3 editions published between 1852 and 1858 in English. 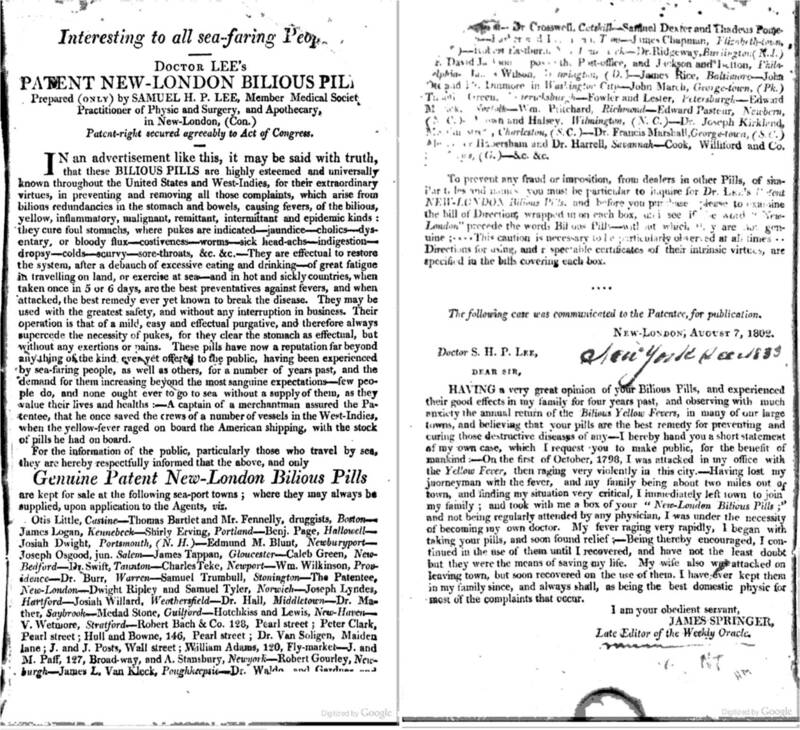 Doctor Lee’s patent New-London bilious pills: only prepared by Samuel H.P. 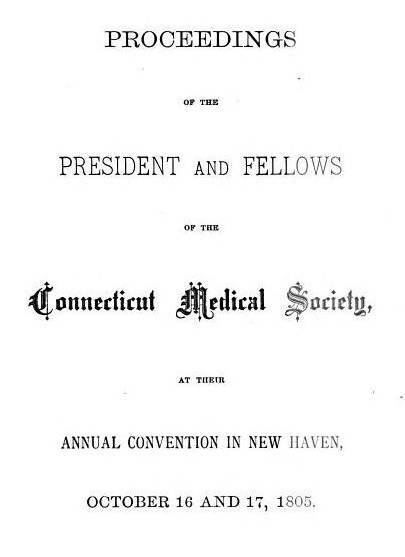 Lee, physician, New-London, member of the Connecticut Medical Society, and fellow of the convention. (Patent right secured according to law.) by Samuel H. P Lee. 3 editions published between 1810 and 1820 in English. Remarks on the stone and gravel in the kidneys and bladder, with an account of the discovery of a solvent remedy, now used with universal success, and commonly known as Dr. Lee’s gravel specific by Samuel H. P Lee. 5 editions published between 1839 and 1849 in English. Address of Dr. Lee on the presentation of the medal of the Royal Astronomical Society to Warren de la Rue, esq., F.R.S by Samuel H. P Lee. 1 edition published in 1862 in English. Remarks on the stone and gravel in the kidneys and bladder, : with an account of the discovery of a solvent rememdy, now used with universal success, and commonly known as Dr. Lee’s Gravel Specific by Samuel H. P Lee. 1 edition published in 1846 in English. Remarks on the stone and gravel in the kidneys and bladder. 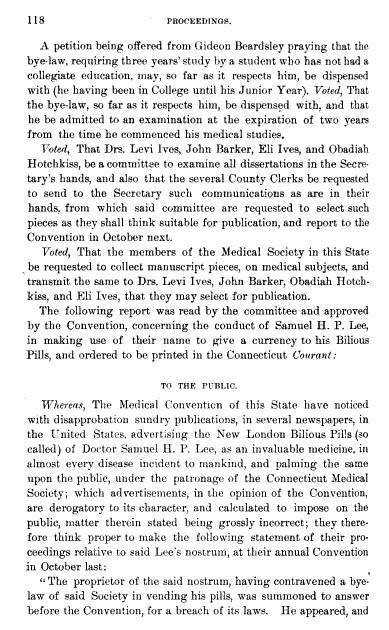 With an account of the discovery of a solvent remedy, … Dr. Lee’s Gravel Specific by Samuel H. P LEE. 1 edition published in 1846 in English. Remarks on the stone and gravel in the kidneys, liver and bladder : with an account of the discovery of a solvent remedy by Samuel H. P Lee. 1 edition published in 1855 in English. Samuel H.P. Lee letter, 1820 Aug. 23 by Samuel H. P Lee. 1 edition published in 1820 in English. Letter from Lee in New London, to Ralph Isham, in Colchester, Conn.; Lee wants a gross of those pills, sees no reason for detaining order; he has a large order to fill and not enough on hand. On compression of the brain from concussion by Samuel H. P Lee. 1 edition published in 1793 in English. Medical advice, and directions for administering the New-London bilious pills. Illustrated with a series of letters from practical physicians, and others; together with certificates of their domestic utility in preventing and curing diseases, addressed to the author by Samuel H. P Lee. 1 edition published in 1820 in English. Papers relating to the division of east, west, and middle commons in New London, with list of proprietors and shares; account of money due John Hempsted and Robert Hempsted on a 1749 bond; two notices from J. Talcott, treasurer to collect taxes (1758 Jan. and May); accounts to Proprietors for services; memo of cash received of trespassers at Pine Swamp, Groton (1771); directions for laying out land and chainman’s oath (undated); receipts (1773, 1776); bill (1794-1798) from Samuel H.P. Lee; and documents pertaining to the rights of Jerusha Gardiner.Dr. Samuel H.P. Lee daybook, 1808-1811 by Samuel H. P Lee. In English. Daybook (up to p. 108) and waste book and ledger (beginning 1 Jan. 1808).E lliott family papers, 1770-1816 by Elliott family. In English. 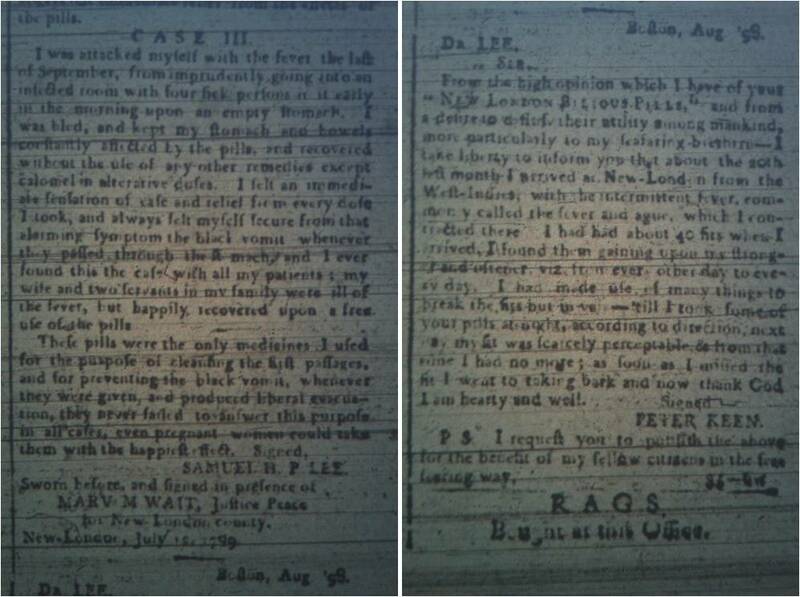 Clark Elliott (1732-1793) deed of sale of 2/3 of house and lot from Andrew Palmes, 12 Dec. 1770; accounts with Mumfords & Redman, 1787, and Guy Richards, 1788; bond with Andrew Palmes, 1780, to Prosper Wetmore; deed of sale of land from George Rogers, 1788; together with letter from William Starr, Middletown, Conn., 26 Dec. 1816, to grandson Clark Elliott; bill to estate of Mrs. Euclid Elliott (Abigail Starr), from Dr. S.H.P. Lee; and list of articles sold Abigail Elliott, by Daniel Starr, 1807.Letter to the firm of Parker & Poor. 1818-1819 by Samuel H. P Lee. In English. Infirmary for the gravel and stone. Those afflicted with the gravel and stone in the kidneys and bladder, may be relieved and cured by the use of a solvent medicine, discovered and tested by many years experience by Samuel Holden Parsons Lee. 1 edition published in 1840 in English. Papers 1805-1912 by Samuel Williams. In English. Deputy surveyor, of Chillicothe and Cincinnati, Ohio, and trustee of Ohio Wesleyan University. Correspondence and writings, including “General Instructions to Deputy Surveyors,” and other material from the office of the Surveyor-General; and papers of Williams’ son, Samuel W. Williams (1827-1928), professor at Ohio Wesleyan University, Delaware, Ohio and McKendree College, Lebanon, Ill., and editor at the Western Methodist Book Concern, Cincinnati, including correspondence, memoirs, autobiography, historical sketch of Ohio, and other writings, and material from the Western Methodist Book Concern. 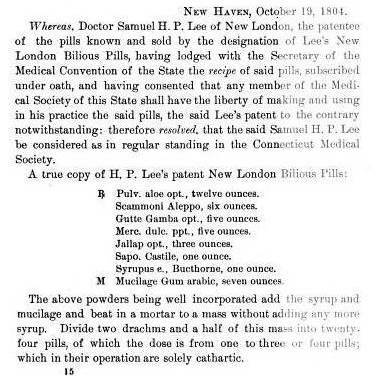 Contact repository for more information.Doctor Lee’s patent New-London bilious pills by Samuel H. P Lee( Book ). 1 edition in 1820. .